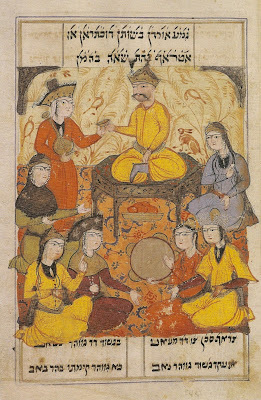 King Ahashverosh and the maidens, Shahin, Ardashir-nameh, Persia, 2nd half of the 17th century (Berlin, Staatbibliothek Preussischer Kulturbesitz). 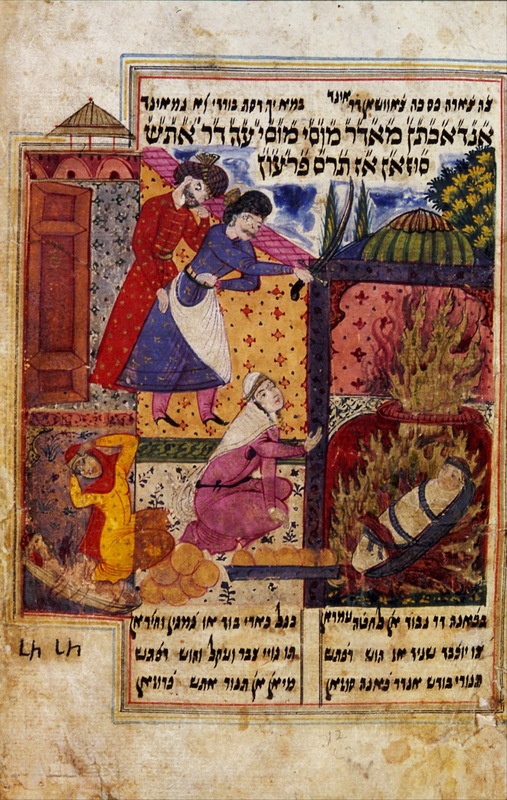 The Jewish community arrived in Persia in two phases. 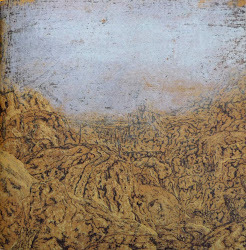 The first around 700 BC at the time of the Assyrian hegemony, when king Sargon II relocated people in the Medes country, in the North and west of todays Iran; and the second two centuries later after king Cyrus freed them in 539 BC. 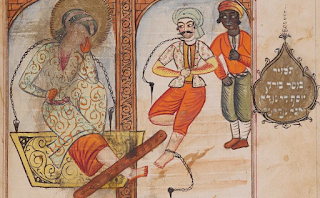 A large part of the diaspora stayed there even once they were free to leave, and they settled throughout the Persian empire for more than two millenaries. 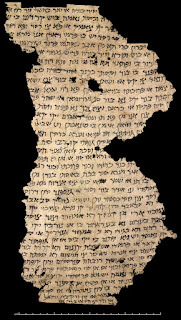 One of the earliest known text documenting this community, dating from the 8th century, is a Judeo-Persian trade letter which Aurel Stein found in 1901 at Dandan-Uiliq, a trading centre on the Silk Road in Chinese Turkestan : it is written in Persian (or rather Judeo-Persian) language with Hebrew script. 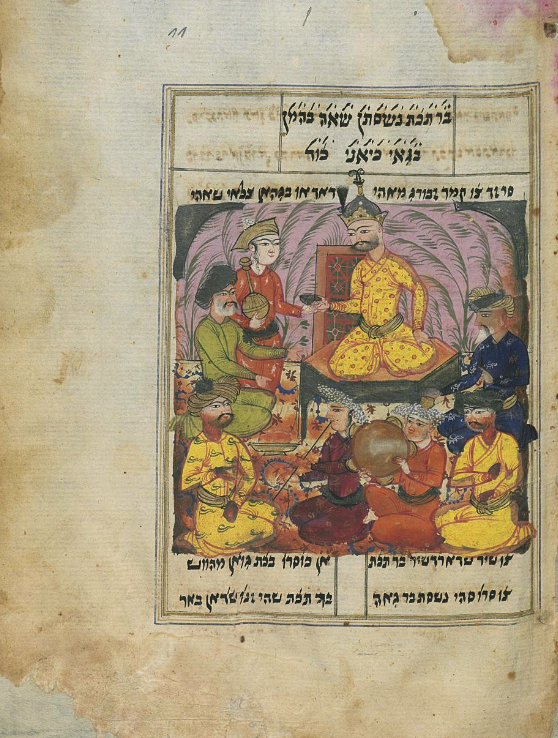 The practice has been in use in Iran, Afghanistan and Central Asia for over a millennium as it was the diaspora’s way to preserve Jewish identity and historical heritage. 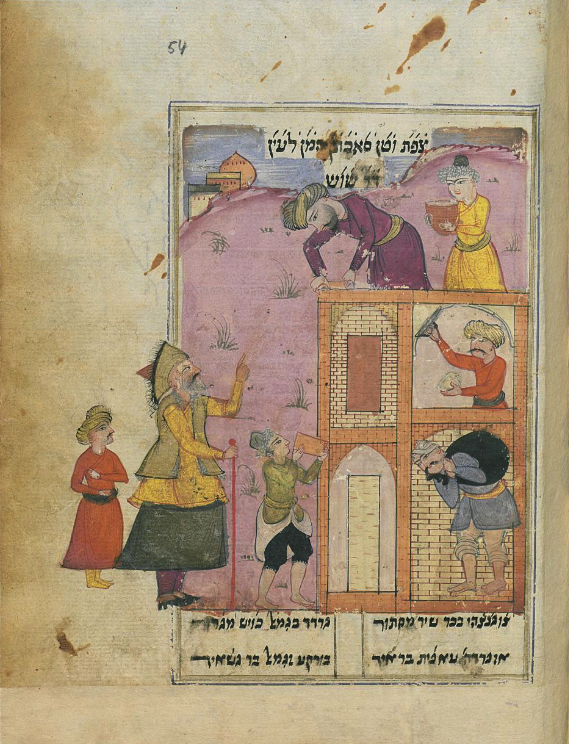 Among the most important medieval Judeo-Persian manuscripts is the 1319 handwritten copy of Torat Mosheh which is the earliest known Judeo-Persian text of the Pentateuch. 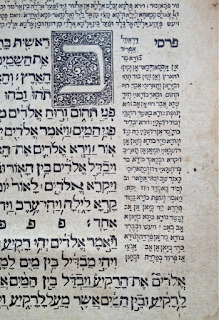 This Judeo-Persian translation of the Torah was also one of the earliest printed texts in this language, in a polyglot Pentateuch published in Constantinople in 1546. 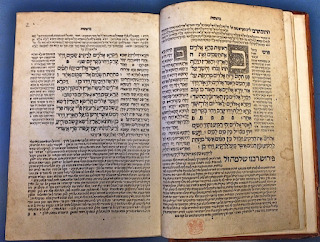 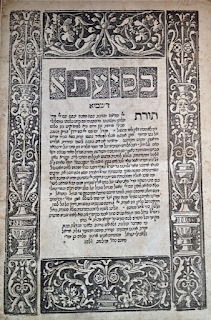 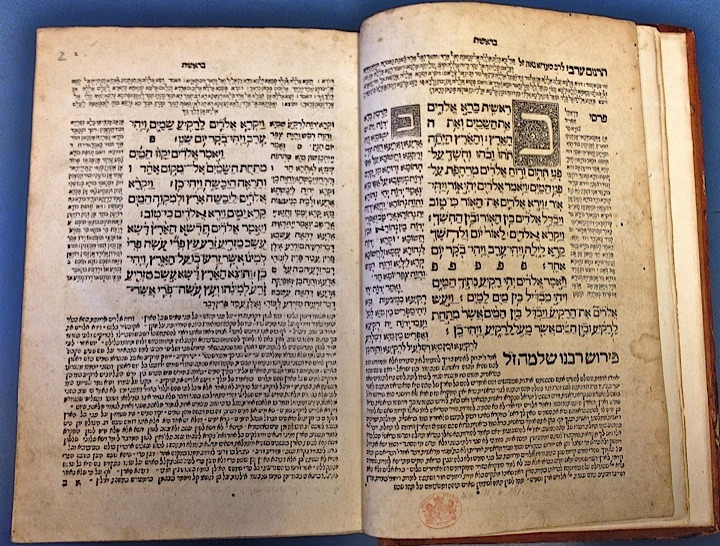 Torat Adonai, Eliezer ben Gershom Soncino, Constantinople, 1546. 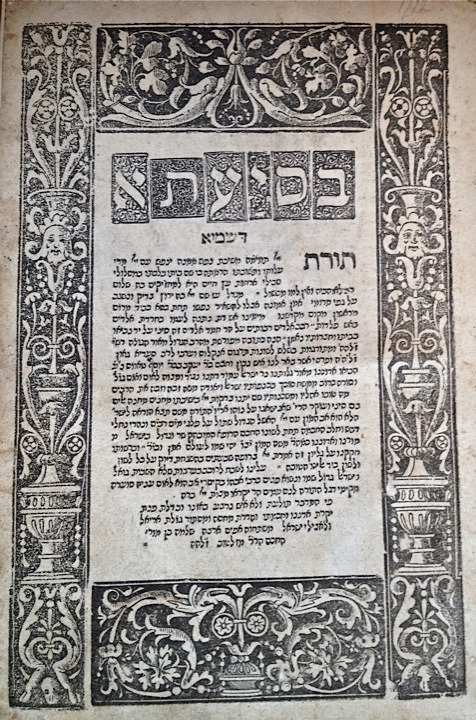 Beginning of Genesis with two woodcuts of the Hebrew letter "bet". 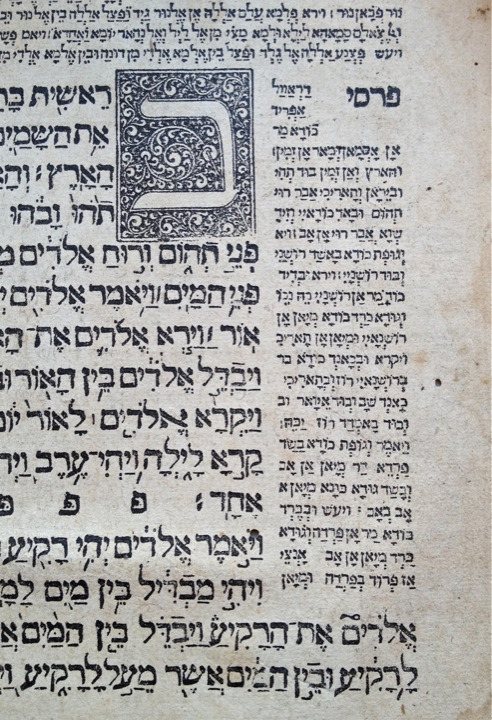 Detail of Eliezer ben Gershom Soncino's Torat Adonai. 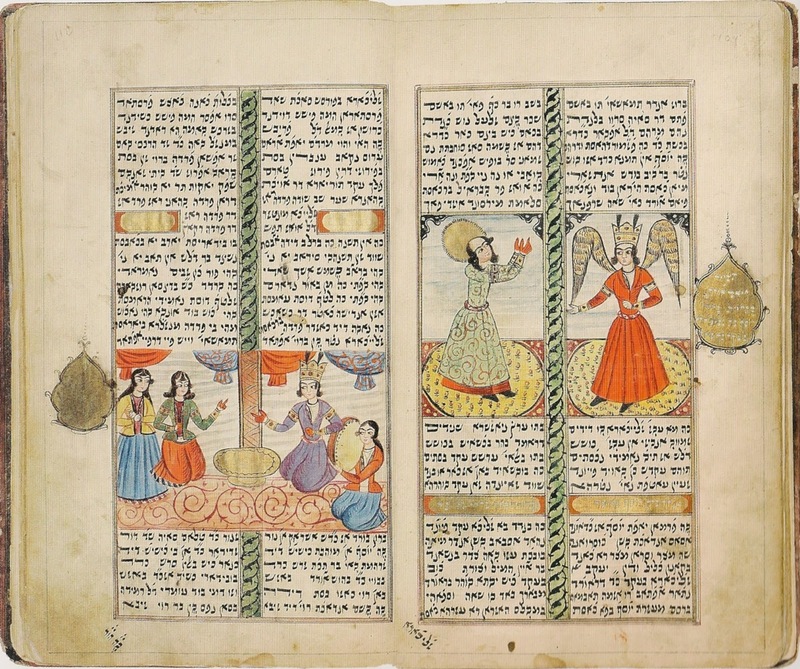 The column on the right contains the Judeo-Persian translation written with Hebrew letters. 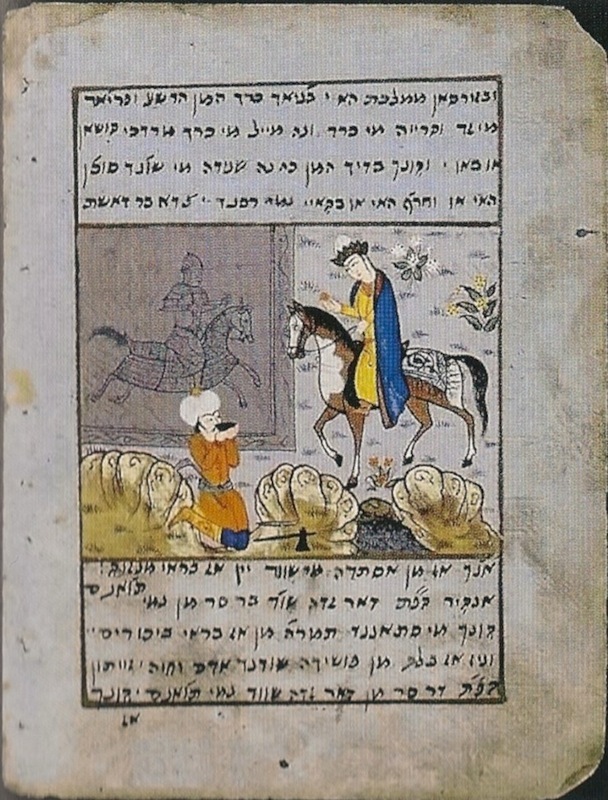 But far from the beautiful illuminated manuscripts of the Jewish communities in Europe, these first Judeo-Persian medieval manuscripts contained only texts and we have to wait for the Safavid era to find illustrations in a Judeo-Persian manuscript — aniconism is in fact a significant characteristic of Eastern Jewish manuscripts. 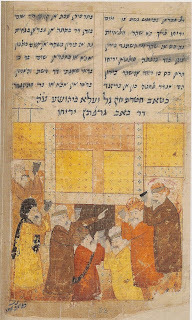 A book, Skies of parchment, seas of ink, edited by Marc Michael Epstein and just published by the Princeton University Pess, offers a wondrous collection of manuscripts and from it, I would like to describe here the arts and literature in the Judeo-Persian communities between the 15th and the 19th. Yes, think of all those beautiful Armenian manuscripts in Isfahan Vank Cathedral, medieval ones illuminated with beautiful letters and full page paintings — and forget them: we only know twelve or thirteen illustrated Judeo-Persian manuscripts, none of which dates earlier than the 17th century. 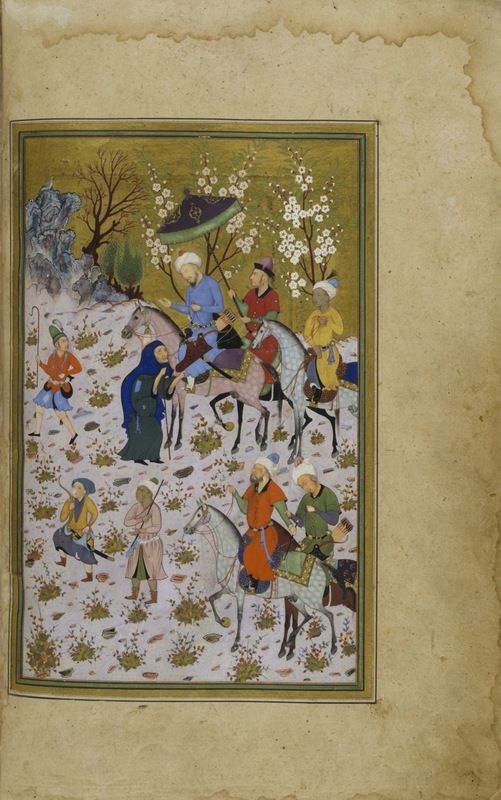 Twelve or so known surviving manuscripts — one hundred and seventy-nine miniatures. 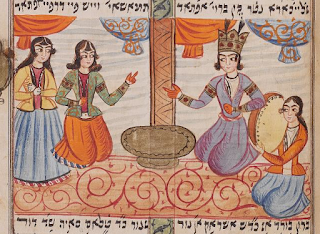 Of course, the Armenian community in Isfahan was a very young one, just coming from Armenia after Shah Abbas ransacked the country, it was a community rich of its own traditions. 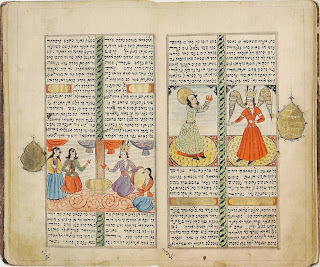 On the contrary, the Jewish community was an old Persian community and its prolonged contact with the Persian culture produced profound acculturation, especially in literature and applied arts. And the period of the production of these Judeo-Persian manuscripts coincides with a very difficult time of anti-Jewish persecutions, a time when the community was not very well-off economically: a number of anti-Jewish incidents took place during the reign of Shah Abbas II. 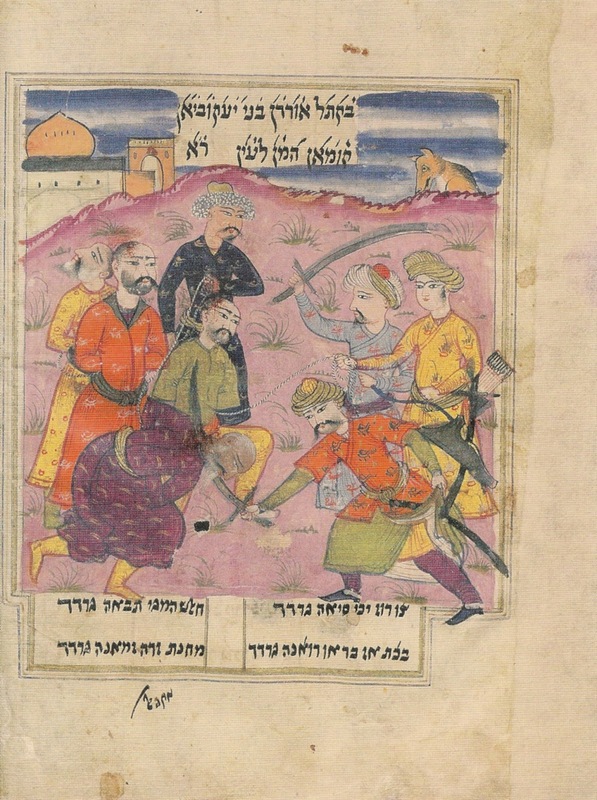 Nonetheless, a few Muslims, among them ranking officials, resisted the order to force the Jews to convert (and Sufis as well as other religious minorities, such as Armenians and Zoroastrians, were also the targets of religious intolerance). 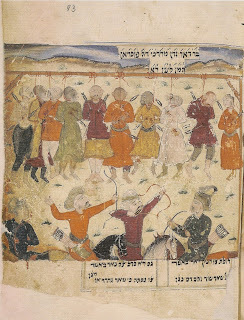 However, most of the major Jewish communities appear to have converted in 1656, and their Jews became anusim (“forced converts”) for about seven years, outwardly complying with Shiite Islam while practicing Judaism in secret, a practice ironically not unlike that of taqiya (dissimulation) practiced by the Shiites for many centuries (the events are retraced in Bābāʾi ben Loṭf’s Ketāb-e anusi, a Jewish witness in Kashan). Angels uproot trees in Ahashverosh's garden. Shahin, Ardashir-nameh, Persia, 2nd half of the 17th century (Berlin, Staatbibliothek Preussischer Kulturbesitz). 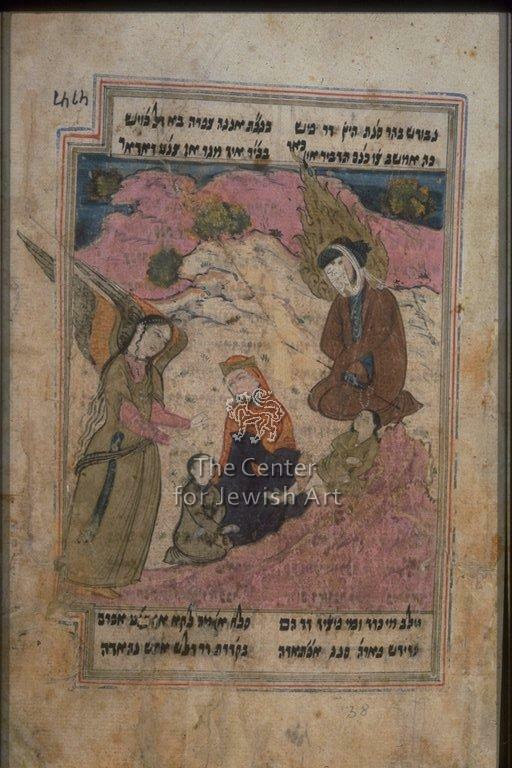 This is an instance where Talmudic and midrashic references are used to enliven the story. 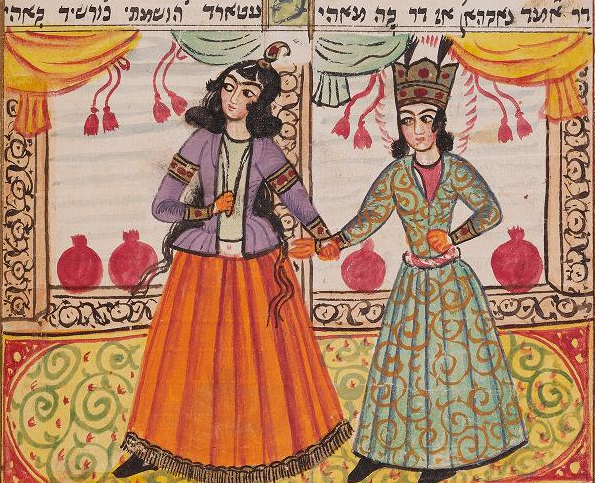 The illustration is a fanciful expansion of Esther 7:7. 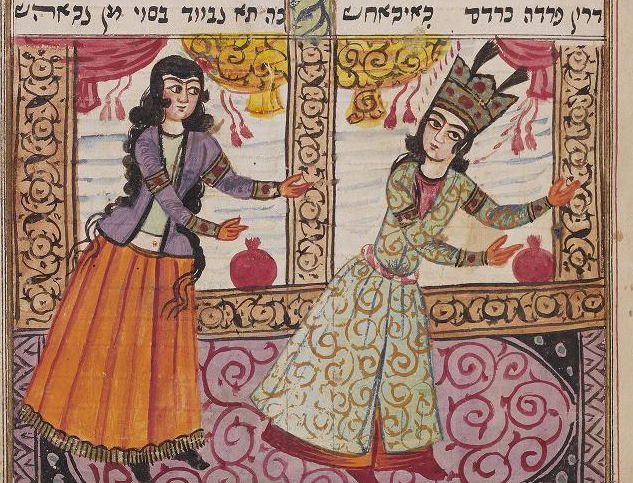 In the biblical text, Esther has just exposed Haman's plot. Ahashverosh rises in anger and "went into the palace garden". 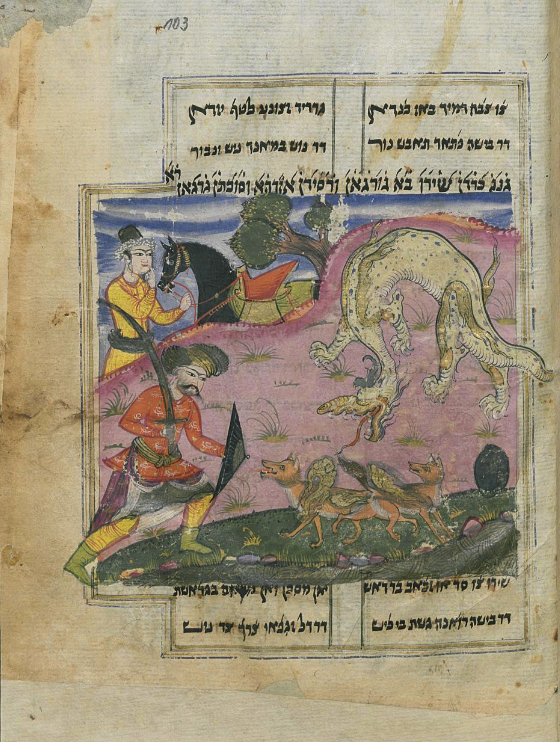 The Talmud suggests that, as we are not told that his anger cooled, he also "retruned in a fury" — but why ? 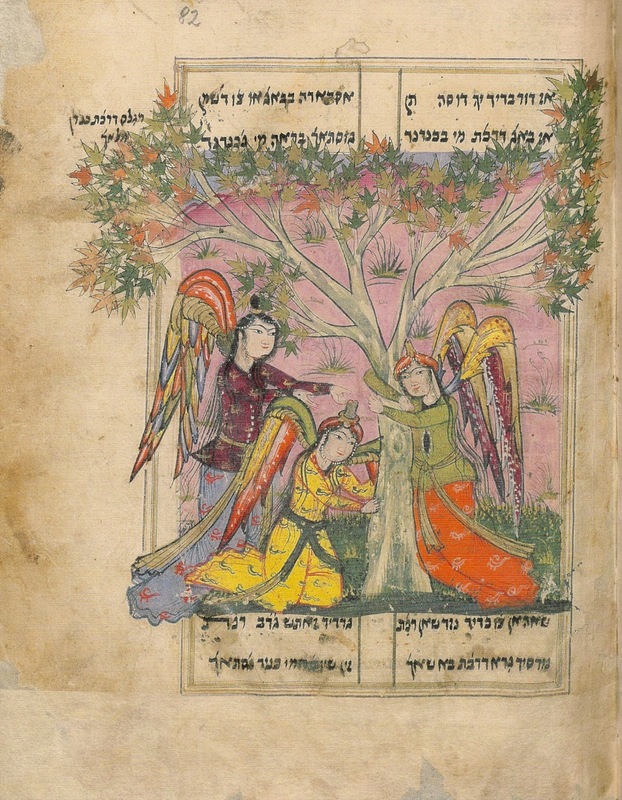 Angels in the semblance of men were uprooting the trees in the royal garden and were doing so at the command of Haman. Mordechai being led in triumph by Haman, single leaf on paper, maybe from an Ardashir-nameh manuscript. 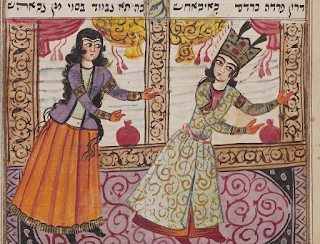 Persia, 19th century. 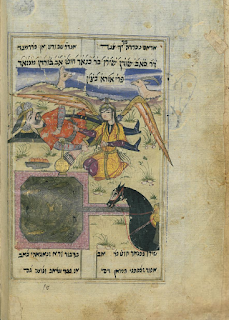 Joshua crosses the Jordan with the Ark of Covenant. Imrani, Fath-nameh, Persia, late 17th century (British Library). 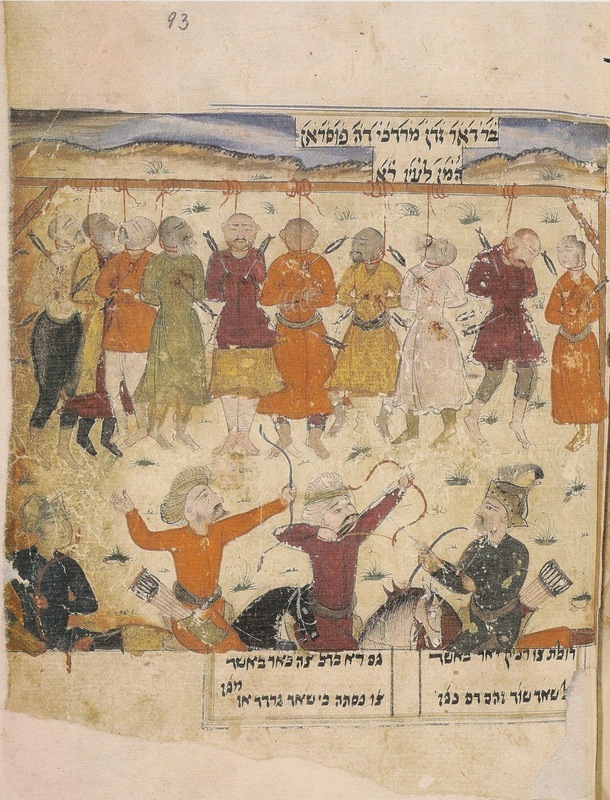 The execution of Haman's ten sons with the bodies hanging from a long gallows and the king and his men riddling them with arrows. 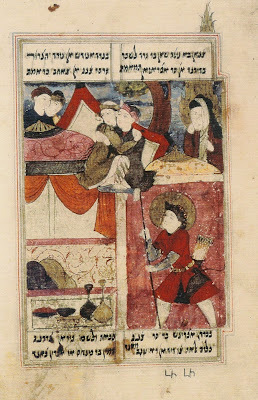 Shahin, Ardashir-nameh, Persia, 2nd half of the 17th century (Berlin, Staatbibliothek Preussischer Kulturbesitz). The killing of Han's collaborators where bound men are decapited by armed Jews. 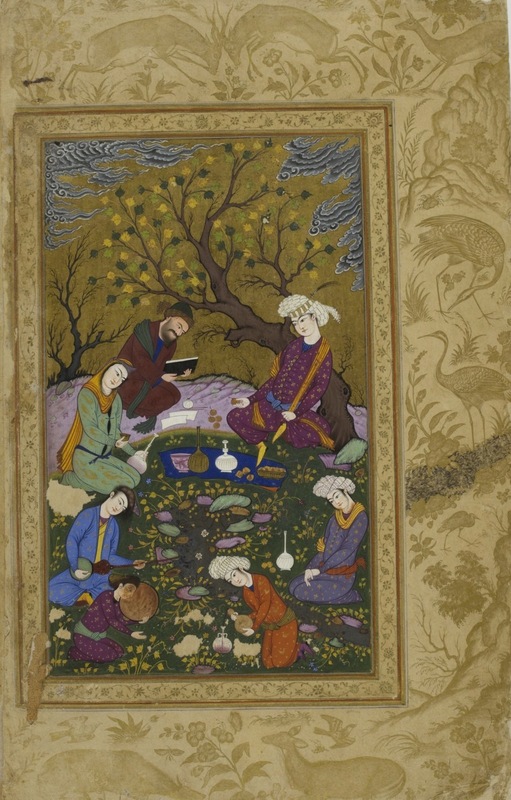 Shahin, Ardashir-nameh, Persia, 2nd half of the 17th century (Berlin, Staatbibliothek Preussischer Kulturbesitz). 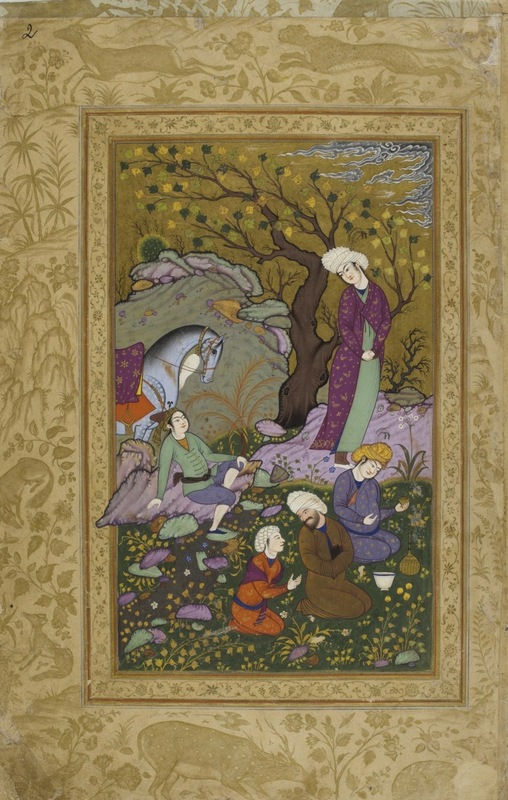 Even if these manuscripts are remarkable, they never reach the perfection of most Persian miniature paintings : they could not equal miniatures produced in the royal workshops like these ones below, and so they rather look like modest popular and provincial works from ateliers of smaller courts, repeating classical schemes — mountains and clouds, riders and strait-winged angels. 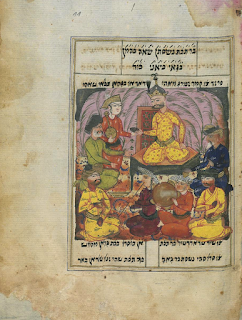 So these Persians Jews began to commission manuscripts that told the stories of their heroes in a way reflecting he style and manner of Safavid courtly manuscripts. 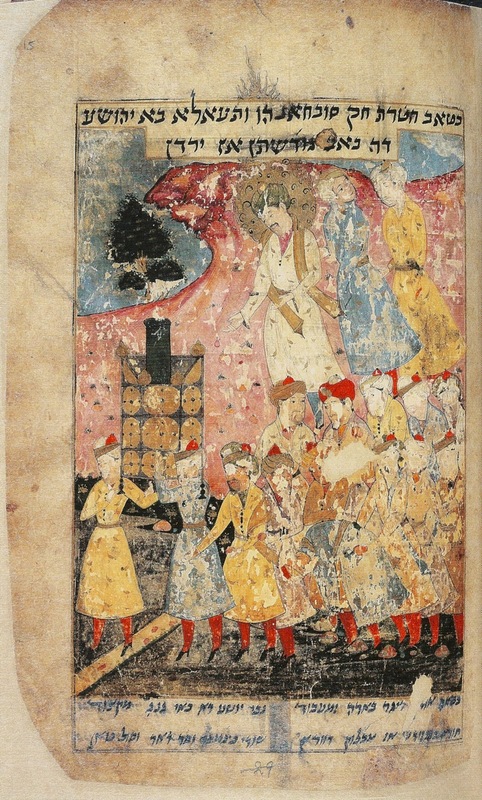 Niżāmī, Maḫzan al-asrār, 1538 (BnF). 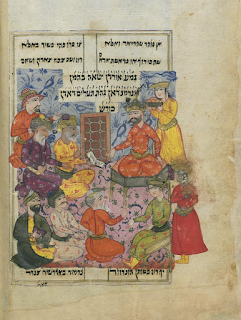 The Judeo-Persian community had never been especially productive in the area of thought or law, keeping the classical rulings of early medieval rabbis. 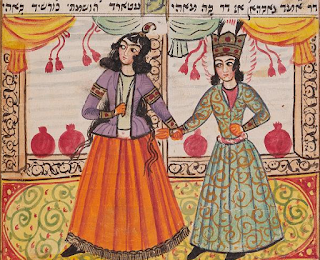 These manuscripts rather illustrate Hebrew transliterations of Persian romances such as Yusuf and Zulayḵā (Joseph and Putiphar’s wife). 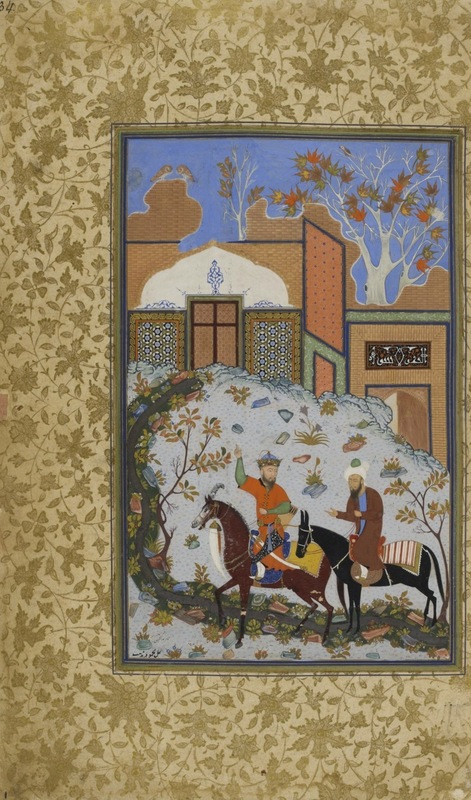 Some are even single leaves of poetry. Most of them are secular rather than sacred works. 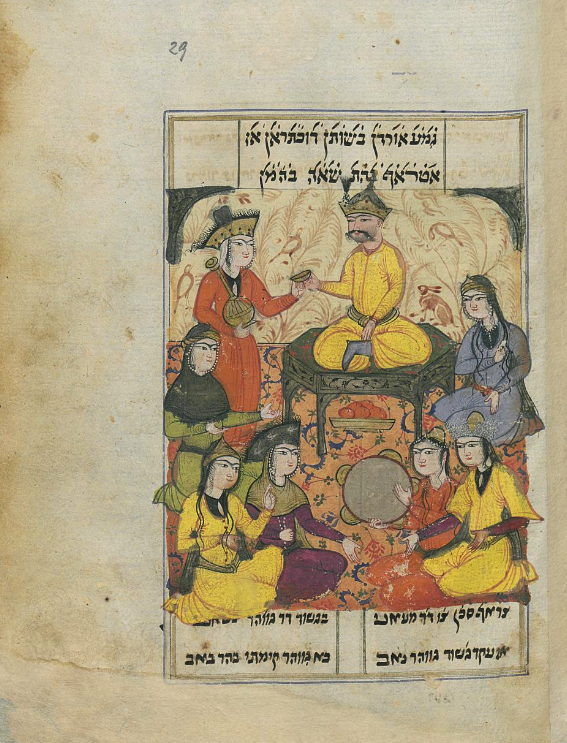 Sometimes the texts just transliterated epic narratives from the Persian literary community when occasionally they followed their own way, still including various popular romances. 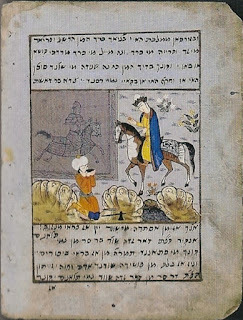 The best examples are the illuminated manuscripts of the epics of the Shirazi Jewish poet Shahin (14th century), the Musa-nameh (history of Moses), imitating the iconographic tradition of Firdausi’s Shah-nameh and connecting Moses with the pantheon of Persian heroes : the texts and of course the illustrations descrive his ordeal to battle with a lion, a wolf and then a dragon, and prove him worthy of meeting with the Burning Bush. 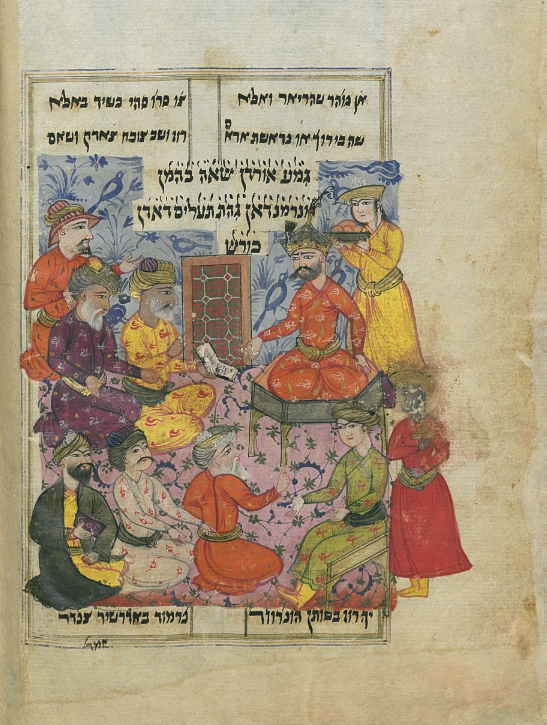 We can assume the manuscripts were written and illuminated for prominent members of larger Jewish communities, such as those of Isfahan or Kashan. 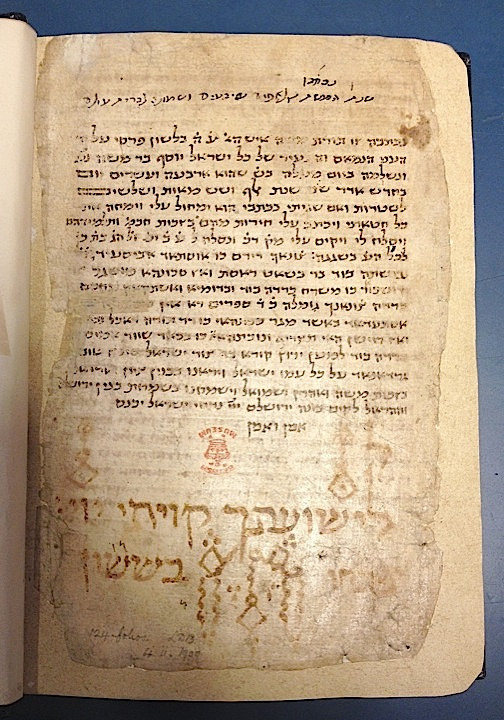 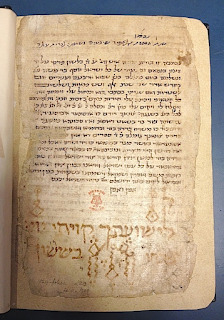 It isn’t even possible to prove that these manuscripts were produced by Jews, as they are all unsigned (but it seems that no prohibition would have restrained them from acquiring these skills). 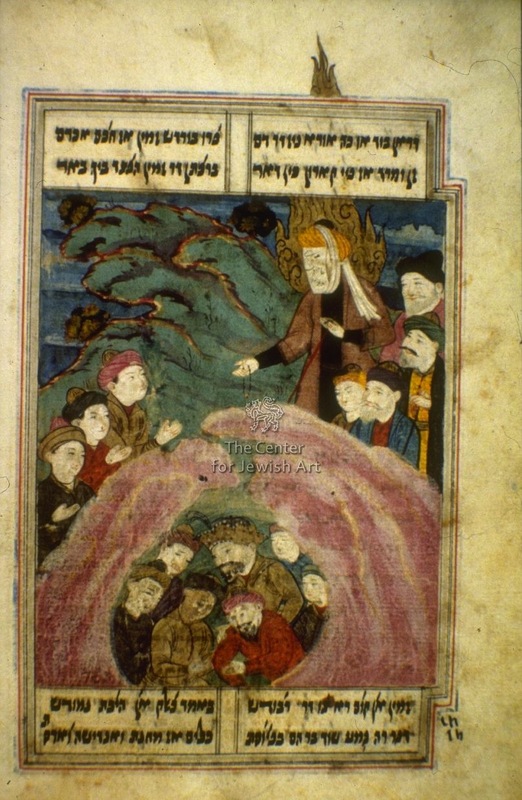 Though, some painters may have been Muslims as suggests the illuminated version of Shahin’s Musa-nameh, copied in 1686 in Tabriz, where Moses’s face is systematically covered by a veil on which can be read in Persian script “His Excellency Moses” (janāb-e ḥażrat-e Musā). 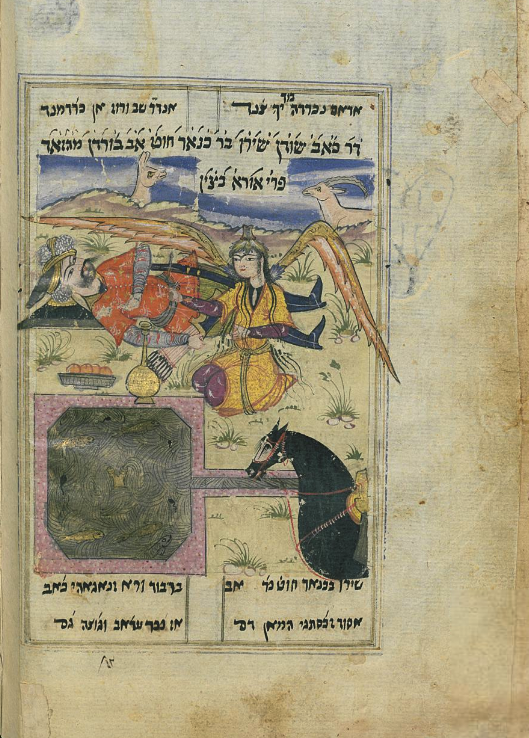 Moses with a white veil on his face and a halo of golden flames watch Pinhas impaling Cosbi and Zimri as they are locked in a sexual embrace (Numbers 25: 6-8), a very unusual scene. 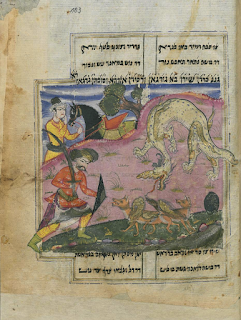 The Musa-nameh emphasize tales of battles between the People of Israel and their enemies, an Moses appears in a manner clearly designed to parallel Muhammad in an implicite comparison. 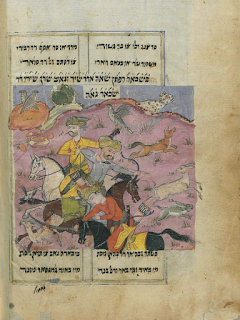 Some of the manuscripts are rather polemical, intending to compare and exalt Jewish heroes to Muslim holy characters. 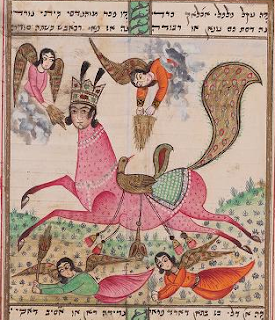 Islam, enshrining versions of the Jewish narrative in the Quran, had incorporated these holy personages in its own tradition so that the representation of Moses with the attributes of Muhammad was not exempt of danger — add Muslims been able to read the Judeo-Persian text. 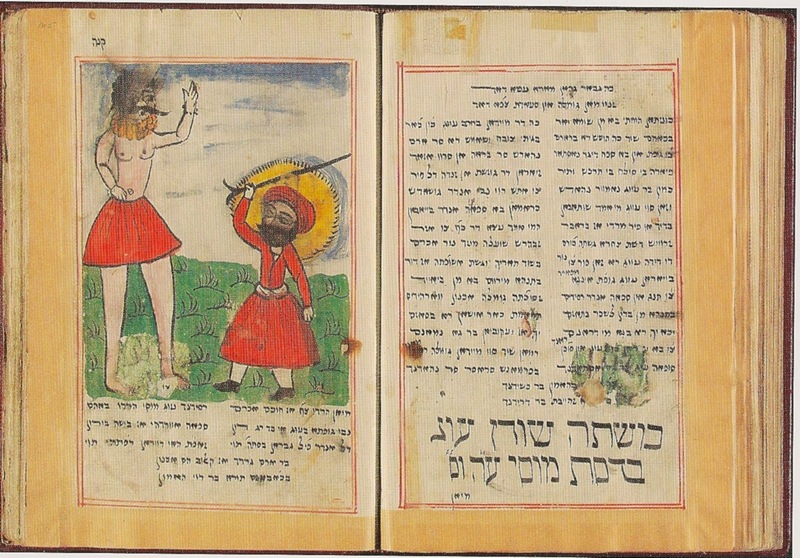 The recurrent glorification of Jewish heroes projects images of empowerment for themselves in a time of persecutions. 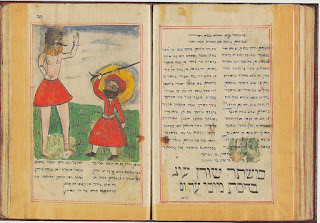 It's a nostalgic representation of a better time, an appeal to the present Shah to live up to its exalted heritage of tolerance, a support for the Jews and a wish that once again the armed Jews, "sons of Jacob", get revenge on "the accursed Haman's people". 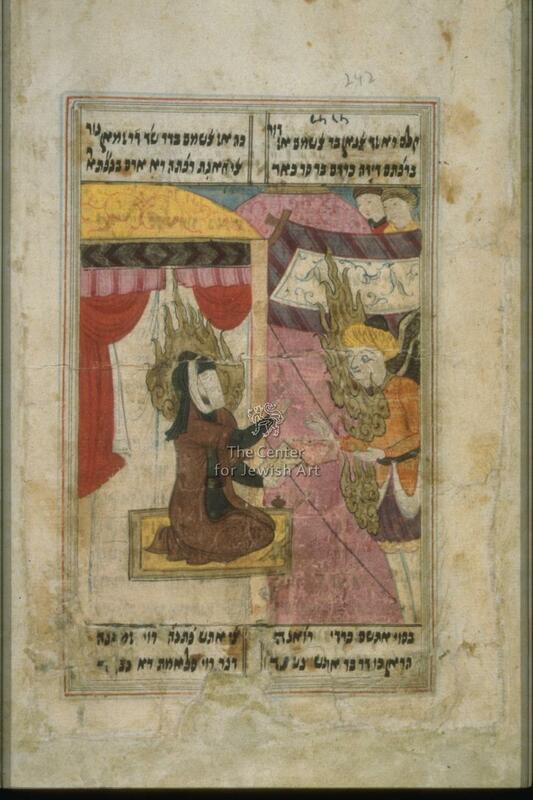 The angel Gabriel (right page) appears to Joseph, Yusuf, to grand him permission to marry Zulaikha. 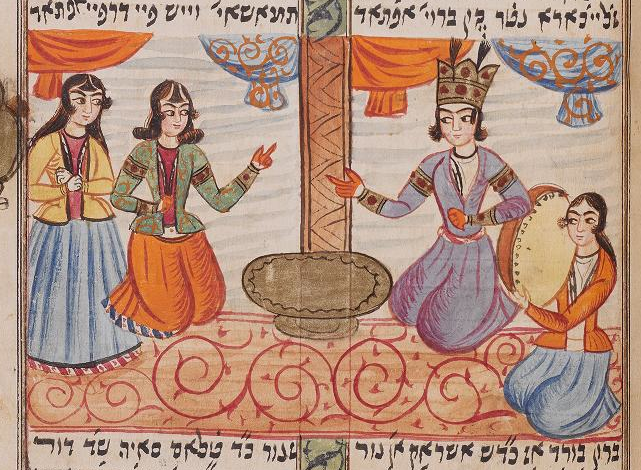 Mashad, 1853. 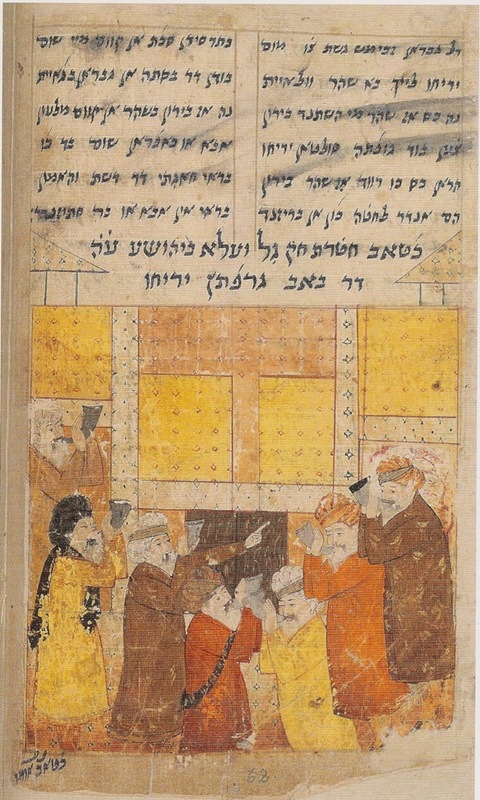 Eliyahu ben Nissan ben Eliyah, in Mashad. 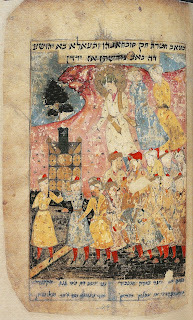 Yusuf runs from Zulaikha. 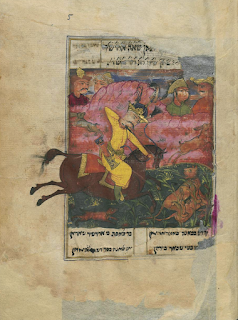 Josuah battling the giant Sihon, Musa-nameh, Persia, late 19th century.